As they say there is always a photo to be had. So when my wife almost jumped out of her skin yesterday when suddenly dark smoke clouds appear right next to our house I did what I always do. I grabbed my camera. Living in the American West makes you jumpy when you hear, smell or see fire. The arid deserts here notoriously fire prone. 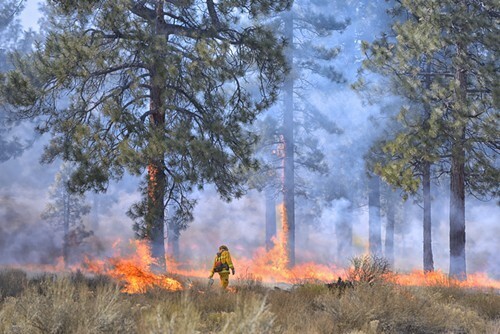 This one turned out to be a prescribed fire with happy firefighters running all over the place. They were happy for once to start a fire instead of always fighting one. While they were doing their work I shot some photos with my SLR using a 70-200mm lens. The colors in the smoke and the combination of smoke, fire and the yellow firefighter outfit made my day. All it took for this photo were 10 minutes and I was back at my computer working on...of course more images.